Inspiration : My sister and I went picking blackberries earlier this week. So I had to make blackberry jam! Picking blackberries has so many memories for me. I love this time of year and picking blackberries has become a yearly tradition. Place sugar in a oven-proof dish and heat in the oven for 5-6 mins. Put blackberry, apples and lemon juice in a pot and bring to the boil. Add sugar, reduce and simmer. 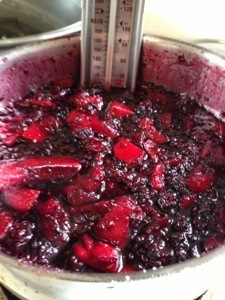 or until jam reaches ‘jam set’ stage on Thermometer. 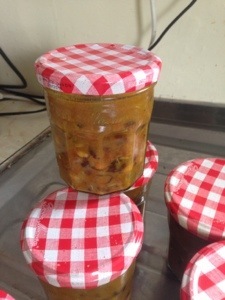 Boil empty jam jars and lids in a pot for about 10min this will sterilise and clean the jars. While the jam is still hot, fill the jars. Clean the rim on the top of the jar. If you spill any on it. Place the lid on and allow to cool. The heat will create a vacuum and preserve the jam. If your freeze your Berries, you won’t have to uses any water. As the berries defrost it will produce some liquid. If you don’t have a jam thermometer, you can uses the “plate test” after about 30 min of cooking. Put a small amount of jam on a plate and place it in the fridge or freezer. If it sets and you can push your finger into it and it wrinkles/sets then it done. You can keep try this method every 10-15 until it set.